Metro Vancouver, B.C. - Over the next three years, members of the Musqueam, Squamish, Tsleil-Waututh and Kwikwetlem First Nations will receive a hands-on education through Kwantlen Polytechnic University (KPU) thanks to a $2.7-million investment by the B.C. government. The funding will bring skills and trades training for LNG jobs to 188 participants, including those who are unemployed, underemployed, receiving social assistance, recent high school graduates, or those seeking a career change. “KPU is proud to be working in concert with the Squamish, Musqueam, Tsleil-Waututh and Kwikwetlem First Nations to deliver training that will lead to employment opportunities in the LNG and construction industries. This unique partnership highlights KPU’s commitment to developing unique and strategic programming that meets the needs of industry, the province and B.C.’s Aboriginal communities," said KPU President and Vice-Chancellor Dr. Alan Davis, who spoke at the announcement earlier today. The content of the courses ranges from essential job skills and literacy upgrading, to more advanced trades training in areas such as scaffolding, environmental monitoring, construction craft worker, carpentry and plumbing, steamfitting or sprinkler fitting. 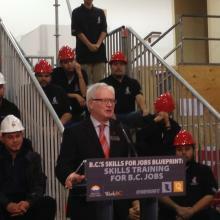 All of the courses are being funded through the $30-million Aboriginal Skills Training Development Fund. Introduced earlier this year, the fund will provide up to $10 million annually over the next three years for Aboriginal skills training. Offering community-driven skills training is part of the province’s efforts to include First Nations in LNG sector opportunities. British Columbia is also working with First Nations on environmental stewardship priorities and financial benefits agreements. The full B.C. government news release, along with additional resources, is available here. Photos from today's event are available on Flickr. Kwantlen Polytechnic University has served the Metro Vancouver region since 1981, and has opened doors to success for more than 200,000 learners. Four campuses—Richmond, Surrey, Cloverdale and Langley—offer a comprehensive range of sought-after programs in business, liberal arts, design, health, science and horticulture, trades and technology, and academic and career advancement. Over 19,000 students annually have a choice from over 120 programs, including bachelor’s degrees, associate degrees, diplomas, certificates, citations and apprenticeships.Learn more at kpu.ca.